The article was published May 31, 1911 in the Indianapolis Star. 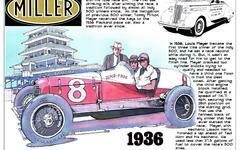 This package presents two articles on the first Indianapolis 500. One describes winner Ray Harroun's arrival in the pits immediately after taking the victory. Well-wishers back-slapping him, mounted police clearing a path for him to drive his Marmon Wasp back to the garage area, and his exhausted condition. On this last note I suspect this was hyperbole, as he is described as too weak to lift himself from his car, his lips split and dry, his face blistered from the sun. His attempts to drink water from a bottle are described as useless because his mouth and throat were too parched. Yet, in his interview quotes, he said he was not tired and that after obtaining relief from Cyrus Patschke for 80 miles, he was "refreshed." The papers were not above exaggeration, but it is a fun read. Another small point, photographers were called "Kodak Fiends" because apparently they showed no empathy for Harroun's distress and sought only the picture. Different times, same behavior. The other, longer article describes the crowd at the race. It underscores the affluence of those in attendance and society in general. The article also describes their reaction to the accidents and the threat to drivers. Most interesting, perhaps, is that it took over an hour from the fatal accident of riding mechanic Sam Dickinson for the news to reach the grandstand. Different times, to be sure.